Yesterday morning was sunny and still so a great a morning for a walk along the bay. The tide had not been a very high one and it was already going out so there was not much water left at the Mullen's roost site. The birds were strung out along the far side - too far away for any good photos of individual birds. 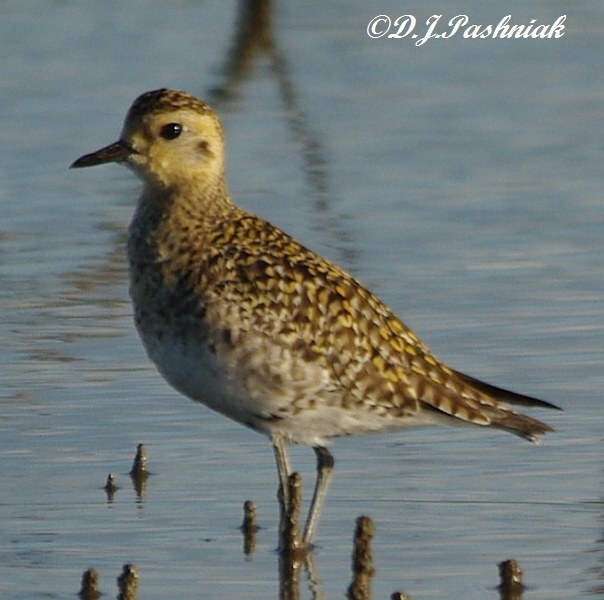 Then I saw movement in front of me and realized there were Pacific Golden Plovers (Pluvialis fulva) walking in among the mangroves. 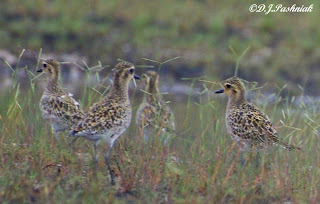 There were three birds and each was at a different stage in changing into breeding plumage. The birds were directly in front of me and not in a good position for the light. Eventually one bird walked around and out into the water where the light picked up the colors of the plumage much better. However, the other two stayed in the shadows. I hope I can get better photos of the plumage change before the birds fly back to the northern hemisphere. As well as extra high tides at the end of last week there were also extra low tides. 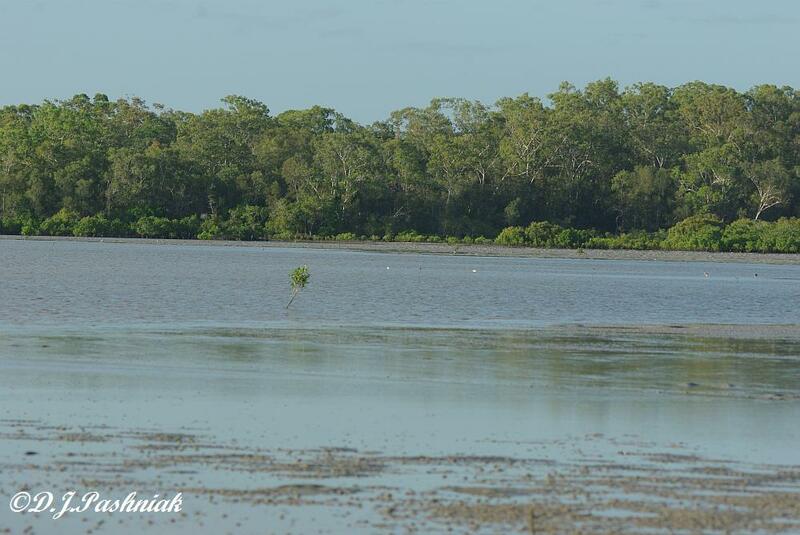 It is only on the very low tides that I can walk out around the sand island at Inskip Point. 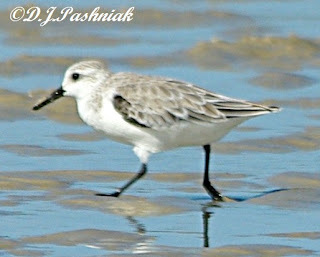 I hoped that I might get some views of small shorebirds on the far side of the island - where I often find them. 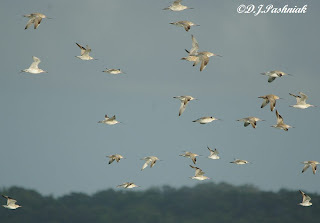 But - one can never be absolutely sure where shorebirds will go and there were none where I expected them. 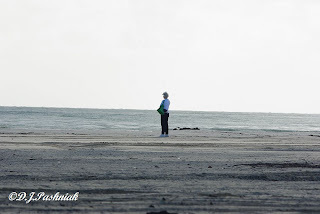 So I slowly walked back across the sand flats and looked for movement. 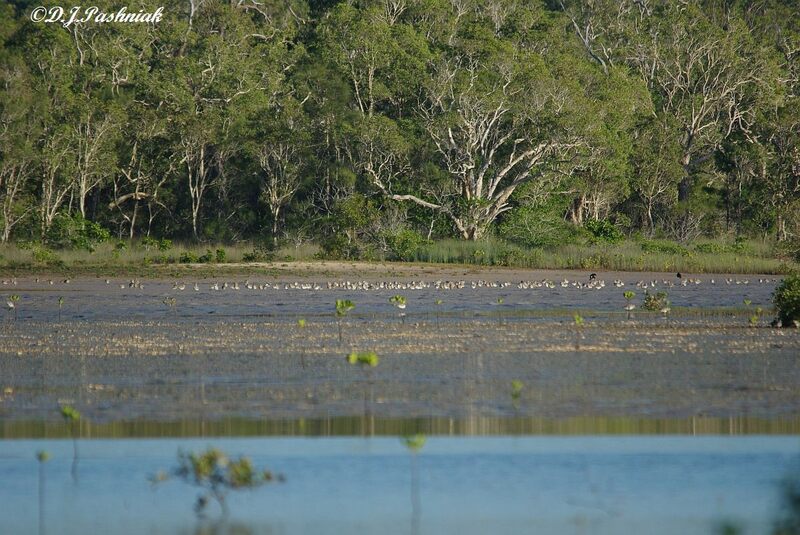 These sand flats are huge and the birds are very small so when there is movement I slowly walk in that direction. With the sun behind me it is possible to get some good clear photos. All these photos are full crops. The water in the photos is only a few mm deep (possibly half an inch or less) but the sun at that angle makes a nice background. 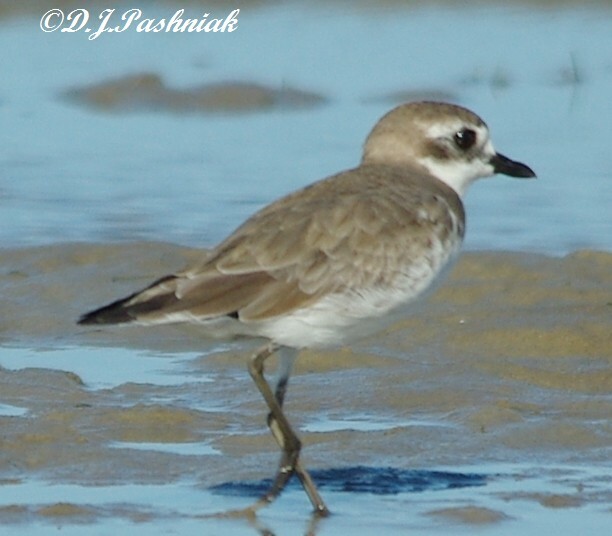 This is a female Red-capped Plover. The bird book gives its size as approx. 15cm bill to tail. 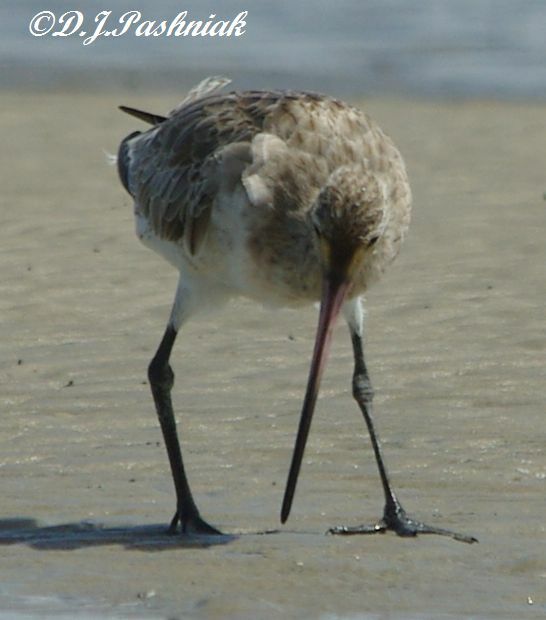 This bird is an Australian shorebird and stays here all year round. 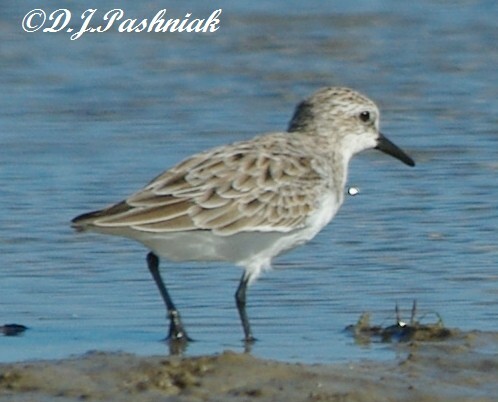 This is a Red-necked Stint. The size is approx. 15cm bill to tail. 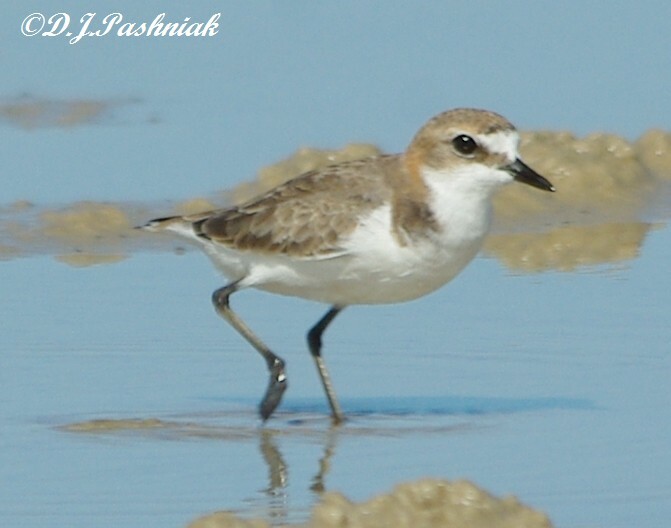 However, it never appears quite as tall as the Red-capped Plover as it is usually moving over the sand with its head down looking for food. The Red-necked Stint is the smallest of the migratory shorebird. Its weight is approx.25gm. This is the Lesser Sand-Plover. Its size is approx. 19-20cms. 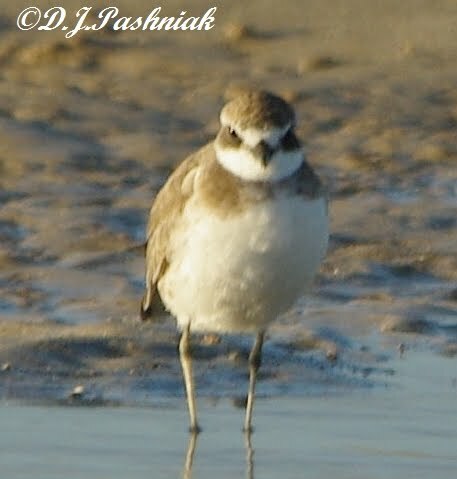 It is not easy to immediately tell the Lesser Sand-Plover from the Greater Sand-Plover since there is not a lot of difference in their sizes. Also a large female Lesser SP may be quite similar in size to a small male Greater SP. 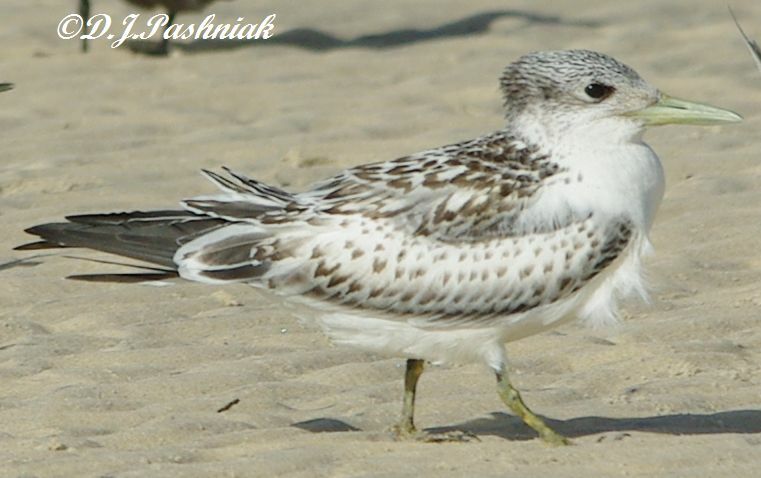 (As with many of the shorebirds the females are larger than the males.) 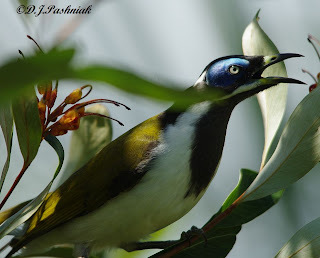 The Greater SP has a longer bill than the Lesser. In non-breeding plumage the plumage colours are very similar. We never see as many Greater SP as Lesser SP and I did not see any that afternoon. 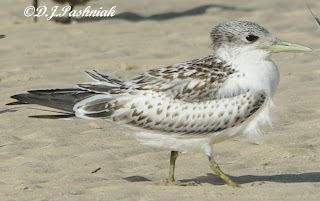 This is a Sanderling. Its size is approx. 20cm. This photo is not quite as clear as the others as I could not get into a position where the sun was directly behind me. This is a Ruddy Turnstone. its size is approx. 23cm. 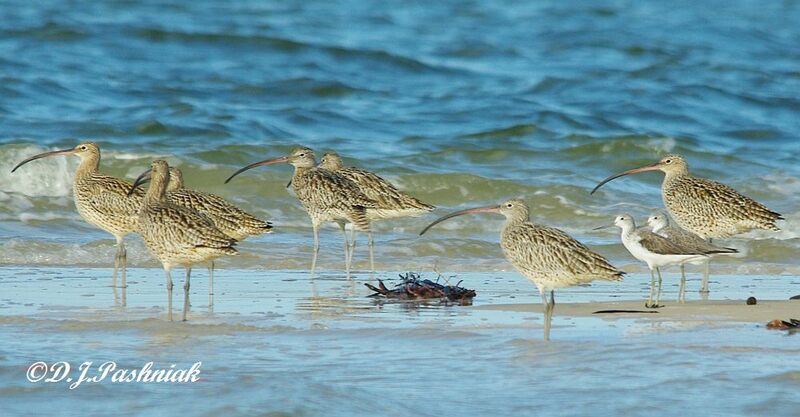 These birds feast on the little crabs that are all over the flats. This bird has a bit of crab in its bill and is about to take pieces out of what is left of the crab in front of it. 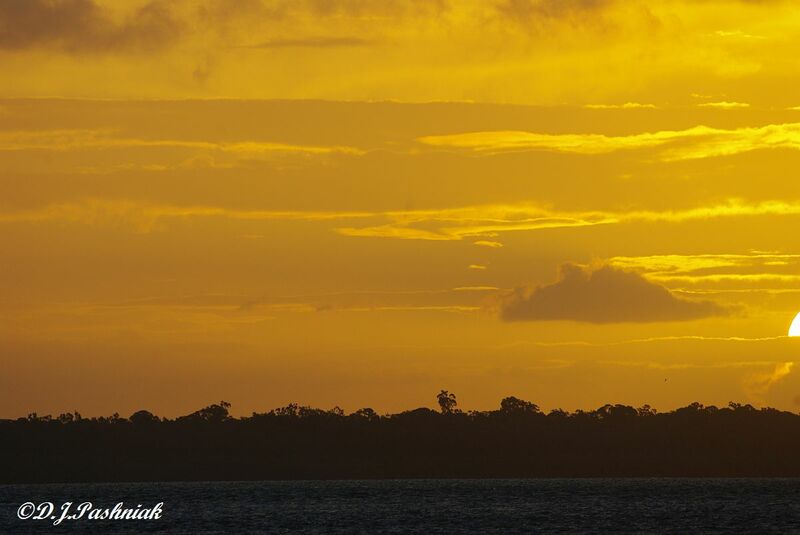 In the last post I told about counting terns out at Inskip Point in the evening. 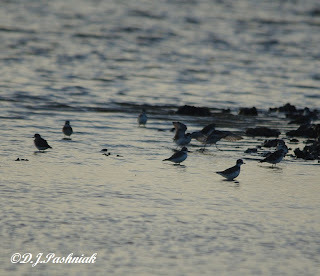 Jill also did a count of the shorebirds that were roosting on the Point. 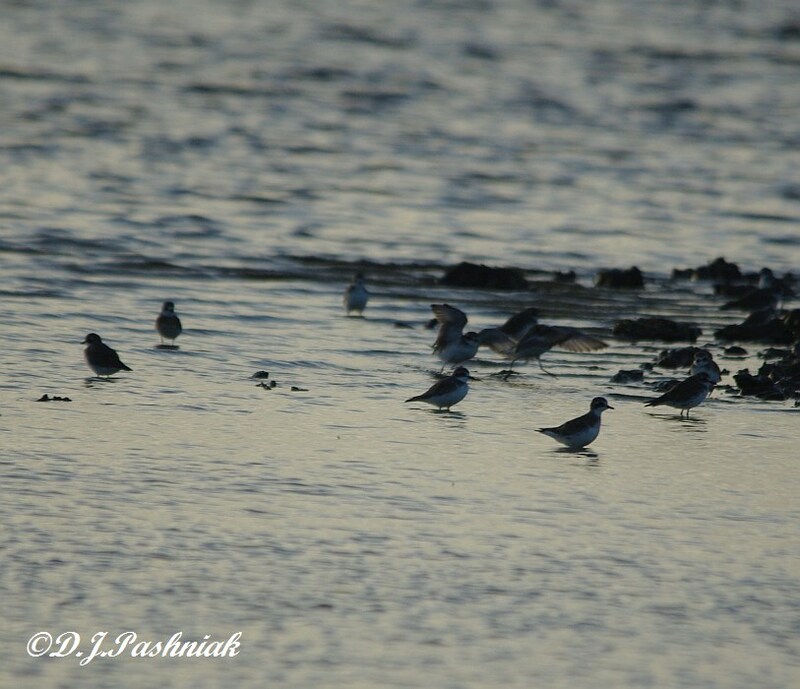 There was a huge flock of at least 1000 mixed small waders. We saw Red-capped Plovers, Red-necked Stints and Lesser Sand Plovers. 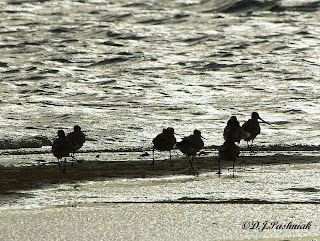 Although I always see quite a number of small waders at the Point I had never seen a flock of this size out there. I suggested to Jill that if we wanted better views of these shorebirds we could possibly find them again in the very early morning before any traffic started using the Point. So the next morning we were out there by sun-rise. Jill has a friend visiting from Switzerland and she came out with us. Trudi was interested and enthusiastic about the birds, the way the sea surrounds the Point on three sides, the way the tide was coming in and undermining the lip of the sand which had been built up over the last month, and everything else which she saw or we pointed out to her. 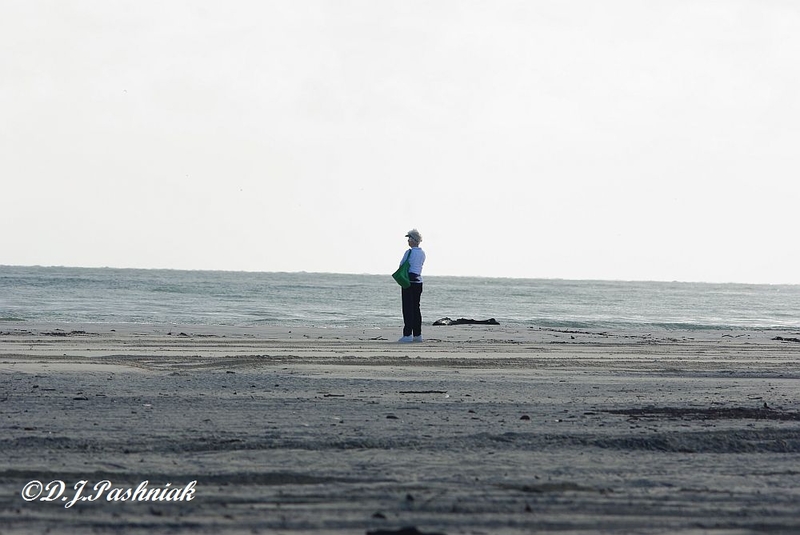 It was no trouble to walk out there with us and she kept up as we walked over the soft sand. She was exactly the kind of visitor it is a delight to show around! Trudi has a birthday coming up in a couple of weeks time and she will be turning 94. What a great example to follow! I hope I can stay as active and involved and enthusiastic as this lovely lady! Now about the birds. The tides over the last few days have been exceptionally high so that the sand island where the birds usually roost was almost covered. 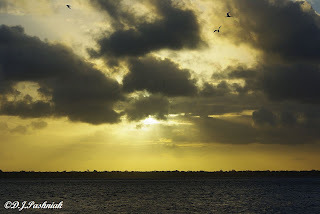 As the water rose around the island the birds flew in to roost on the Point. There were small numbers of Terns but most had already left for their fishing grounds out at sea. 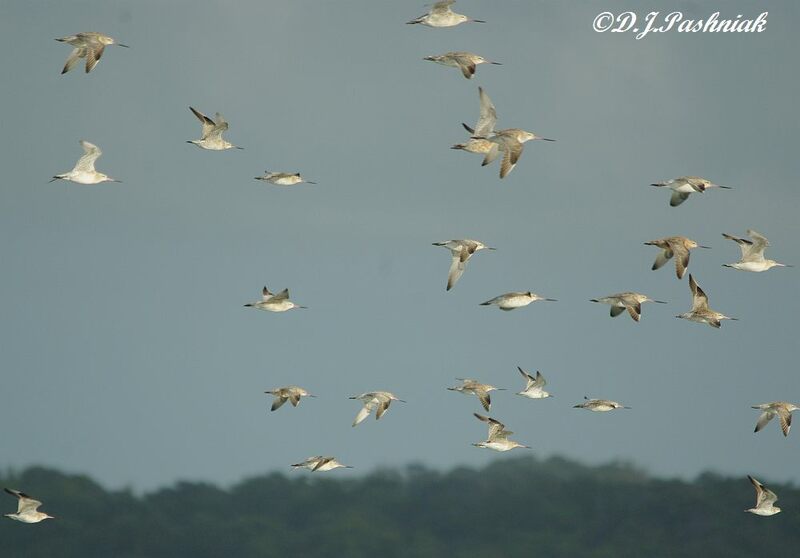 There was a flock of 820 small waders. 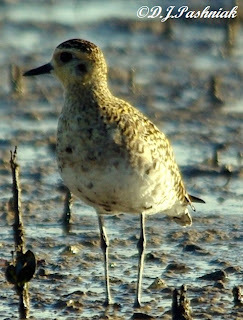 There was also a flock of 1140 mixed larger waders. 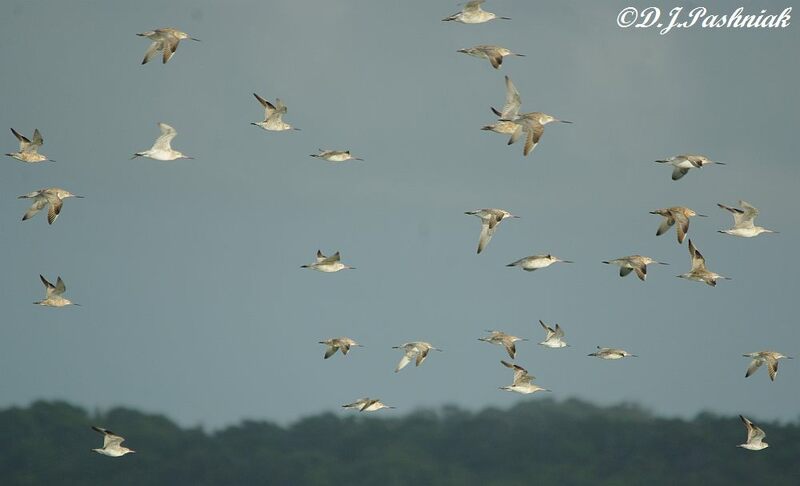 This was made up mainly of Bar-tailed Godwits, Whimbrels, and Great Knots. The small waders were on the north side of the point and the larger waders were strung out along the south side of the point. Jill counted and I recorded and then I started to move a little closer to get some photos. 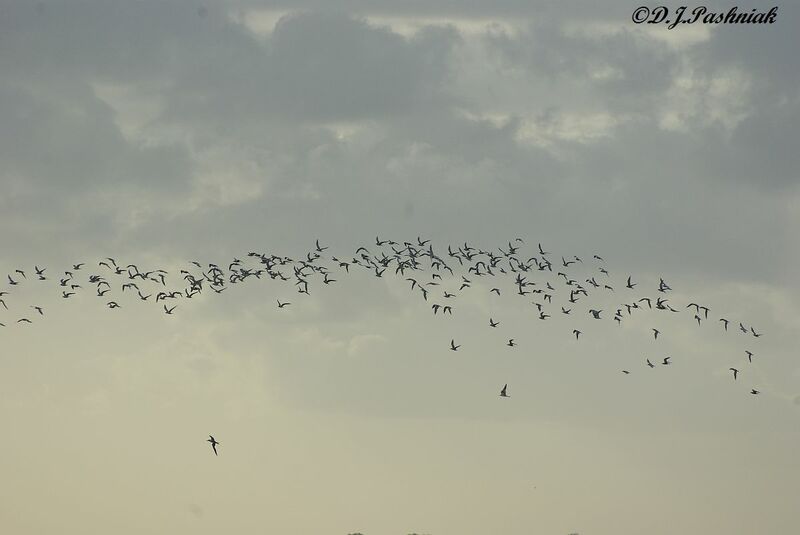 Before I got anywhere near the birds they all flew up! A White-breasted Sea-Eagle had flown over and frightened them all. 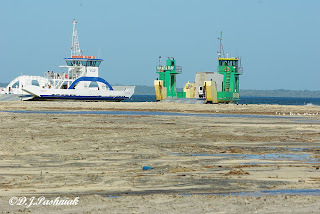 With the island almost under-water and the Point a less desirable place they all set off towards Fraser Island and in the direction of Hook Point. 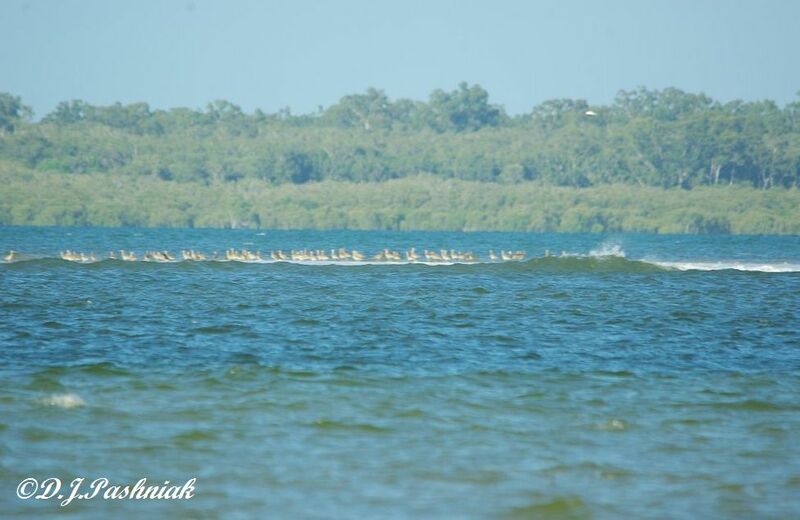 Mainly Godwits and some Great Knots. The small waders followed them. 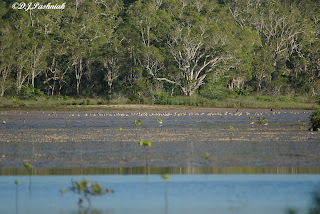 There is no recorded roost site on Fraser Island in that direction but I have seen birds set off in that direction a number of times. 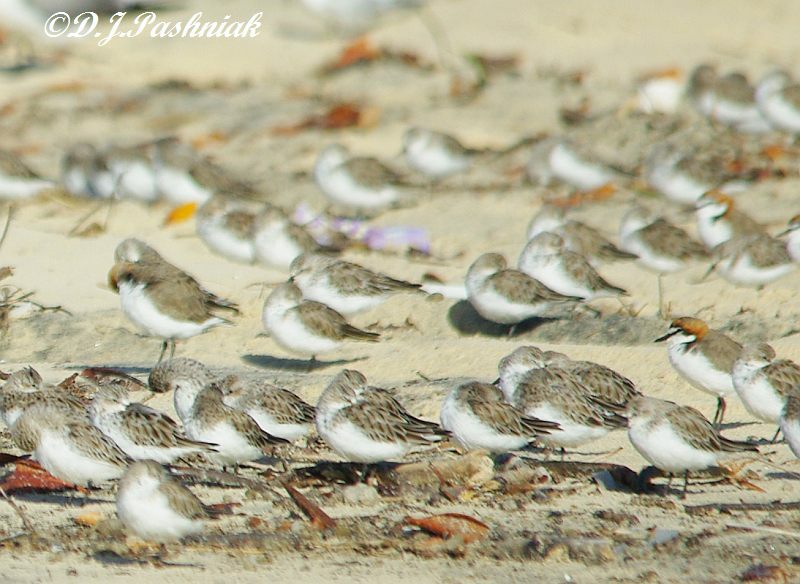 Part of the flock of small waders - Red-capped Plovers, and Red-necked Stints. 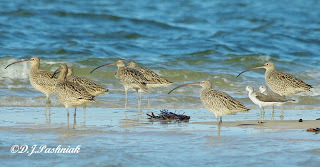 Eastern Curlews were the last to leave the sand island. Some of them came in and roosted at the very end of the Point and persisted there even with the waves beginning to break over the area. The tide was coming right over the Point by the time we left and it was still an hour or so until high tide. 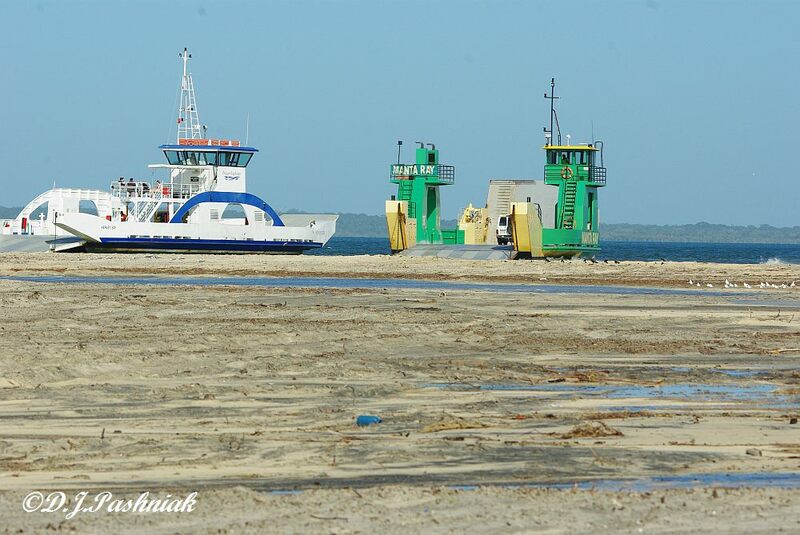 The barges which carry vehicles to Fraser Island would have had to move before too much longer. 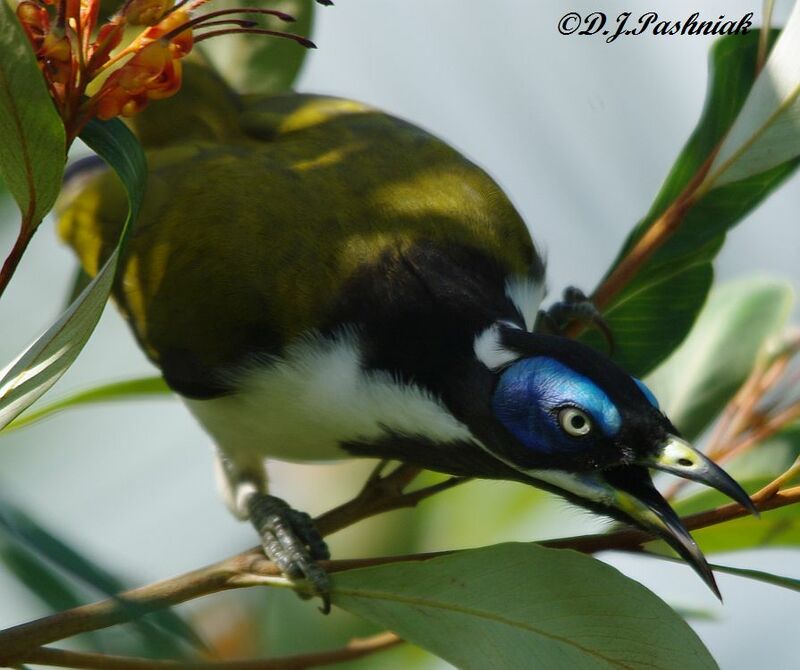 For more bird photographs go to the Bird Photography Weekly. 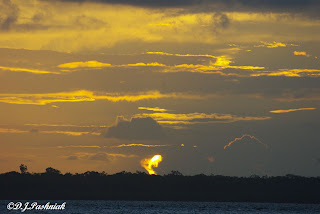 Jill Dening from the Sunshine Coast has been up this way for a couple of days so of course we went out to Inskip Point yesterday afternoon for a Tern count. Terns feed out at sea and although some of them come in during the day for a rest on the sandbanks, most stay out at sea all day and only come in at evening time. To count them you have to be prepared to stay down on the shoreline from before sunset until about 45 minutes after. By this time it is so dark that it is not really possible to see and count the late comers. Crested Terns are here all year round but their numbers are down right now because many of them are on off-shore islands where they breed. There are only a very few Caspian Terns here. The migratory terns are here right now in great numbers. 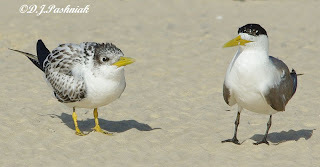 The most numerous are the Common Terns, then fewer numbers of Little Terns and even fewer White-winged Black Terns. 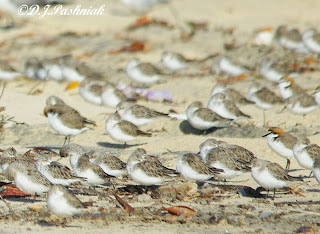 Of course there were also numbers of shorebirds using the same roosting place. (More about them in the next post.) 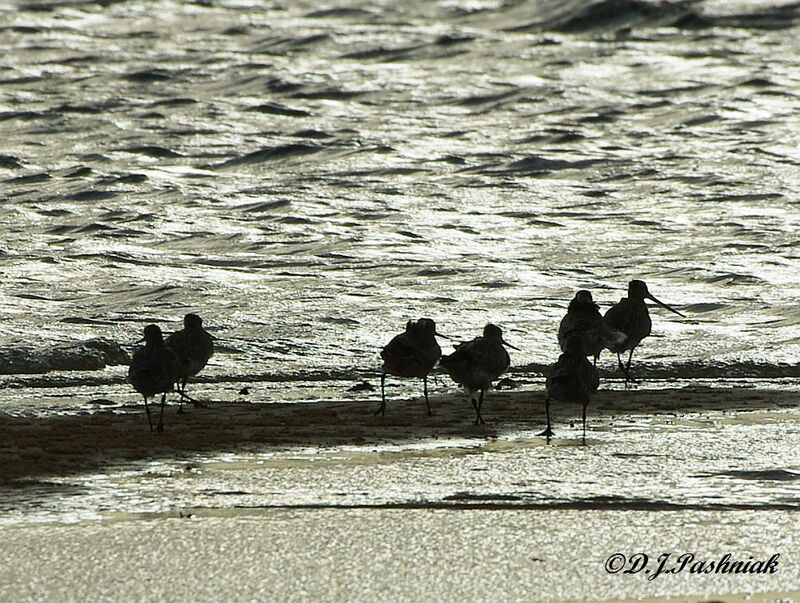 These Godwits were in silhouette as we walked onto the Point. 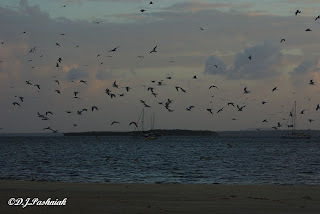 We soon saw flocks of Terns coming down the channel between Fraser island and Inskip Point where we were standing. There was a bank of cloud to the west and it gave spectacular views of the terns when they flew in at a height. The darker it got the more terns came in. I was quite happy to stand beside Jill and record numbers and species as she called them out to me - although she also made good use of a couple of 'counters' - one in each hand to record the two main species - 'Commons' and 'Littles'. She counted in excess of 5,000 terns last night. Jill says that all I need is LOTS more practice! Hmmm! Maybe I need to set up a schedule of Tern Counts with a few friends that don't mind just standing or sitting out at Inskip Point while the sun goes down. This is what you watch on an evening like last night! 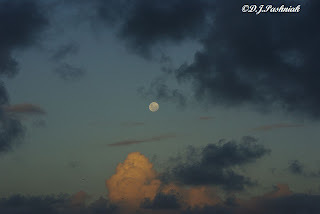 It was close to a full moon last night. 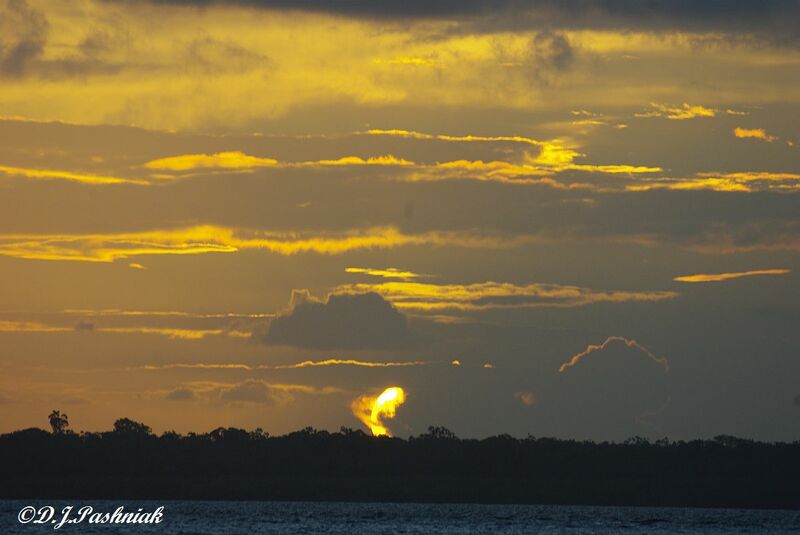 Looking in the opposite direction the sun slowly set. What a beautiful world! 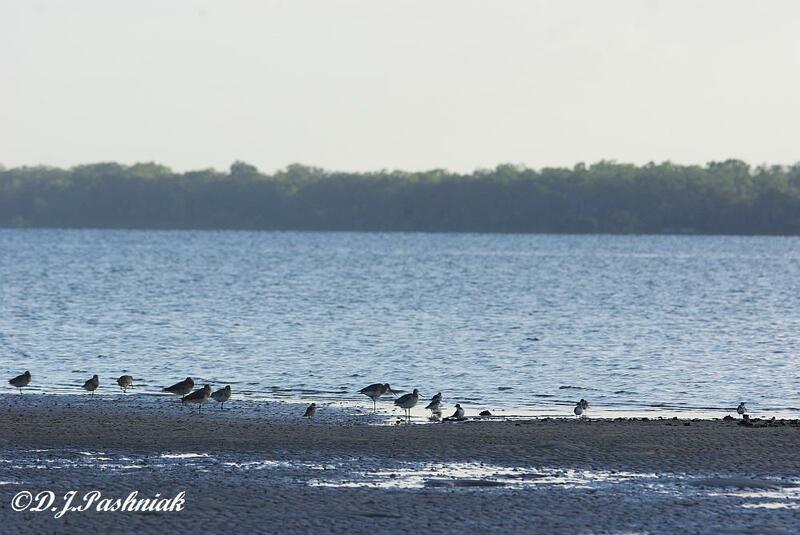 I wanted to try for some more photos of the shorebirds at Mullens on a good high tide. 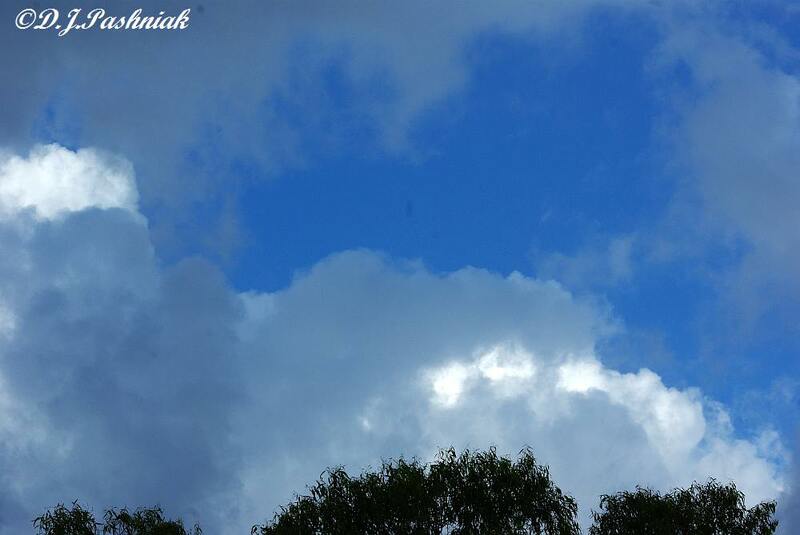 There were a few patches of bright blue sky so I though it was worth a try. 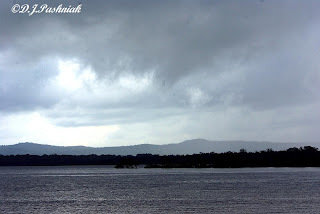 The wind was only light and I could wait for passing clouds to give me better light. However, I had no sooner kayaked into the end of the Mullens roost site than one of the rain squalls hit. It blew off my hat! It blew the kayak sideways into some mangroves! It drenched me in a very short time. My glasses were damp with rain. The binoculars were also. The small towel I keep in my pocket to wipe away the wet was just as soaked as I was. I gave up and paddled back into a strong wind as far as the car park. At home three hours later the sky was blue - but the tide was half way out and there would be more dry sand than water. I really would like some nice fine Queensland summer weather! I always enjoy walking along the edge of the bay in the early morning and yesterday morning was particularly enjoyable. It was still cool enough that walking was enjoyable and there was a little breeze to keep the worst of the biting insects away. 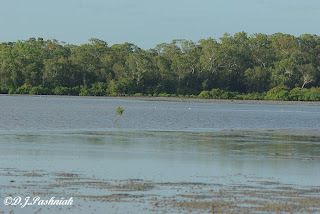 The tide had been high an hour or so before I got down there and the sand flats were beginning to be exposed. I had walked along to a little rocky inlet where the shoreline turns. I was looking to see if I could see the pair of Pied Oystercatchers that often sit out there when I realized that there were a lot of small shorebirds out there as well. The only problem about trying to see shorebirds that early in the morning is that the shore runs north and south so looking out over the bay is looking directly into the bright morning light. I walked out towards the birds and they were almost in silhouette against the light. I slowly went closer but at an angle so that the light would be 'side on' and watched for signs that I was not disturbing them. I had just got into a good position and had taken a few photos which showed that they were mostly Lesser Sand-Plovers when there was a dog's bark from further up the beach and some more morning walkers passed along the beach behind me. Suddenly the birds all flew up and out across the water. There must have been at least two hundred in the flock. Most of them had been invisible hidden amongst the rocks. 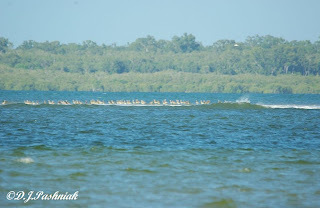 I turned to go back closer to the shoreline when I realized that there was another group of birds on another sandbank that had come out of the water by this time. 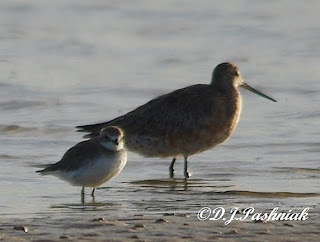 There were more Lesser Sand-Plovers as well as a number of Bar-tailed Godwits. It was interesting to see the difference in size between the two. 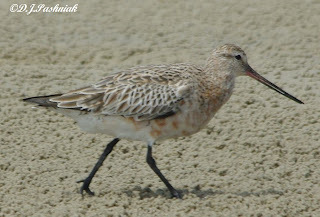 The tide was going out quite fast now across the sand flats and as it fell the larger shorebirds moved out into the water to hunt for food. Every now and then I could see their bills probing down into the water after some piece of suitable food. 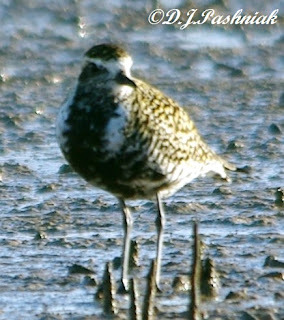 The exposed sand was still covered with a sheen of water and there was movement all over as the smaller shorebirds pecked at the soft sand. If the weather stays calm then it should be perfect for kayaking in the same area in a couple of days time. 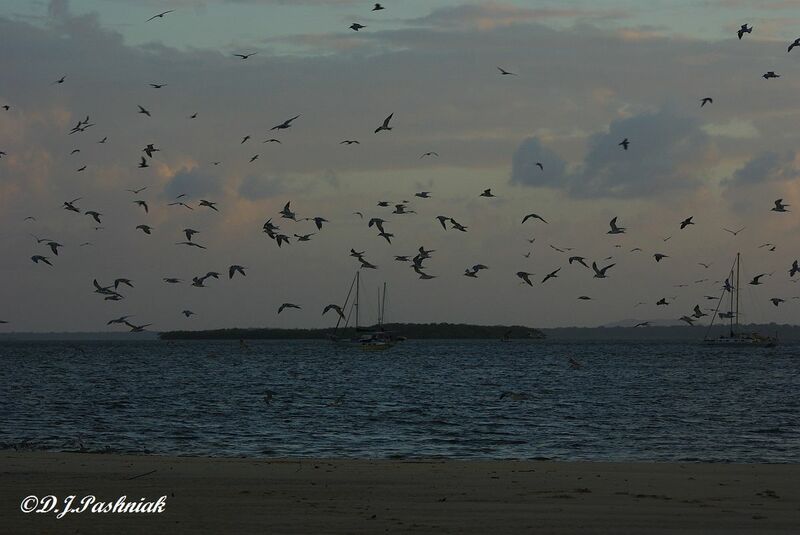 While I was out at Inskip Point the other day I watched a small flock of terns that were roosting on the point. There were three of the six species that are often here. 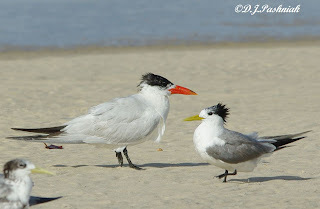 A Caspian Tern (Hydropogne caspia) on the left and a Crested Tern (Sterna bergii) on the right. 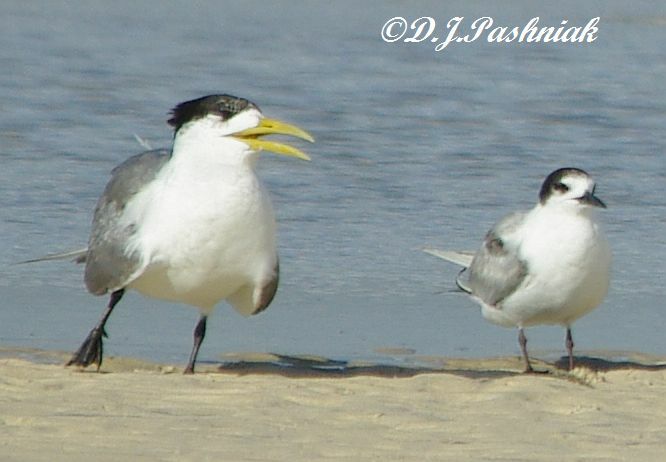 Both of these terns stay in Australia all year. 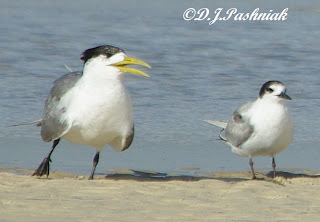 A Crested Tern on the left and a Common Tern (Sterna hirundo) on the right. The Common Tern migrates down here for the summer. 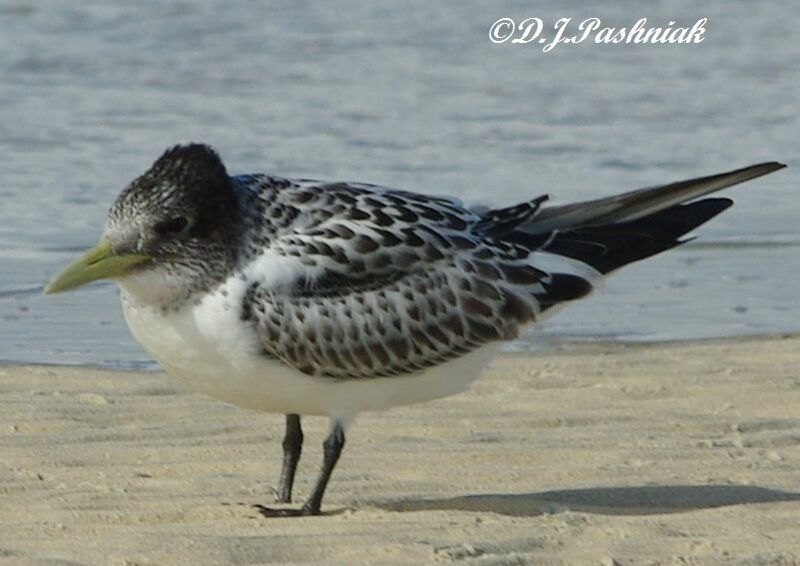 Most of the Crested Terns are still away in breeding colonies on off-shore islands but some have already raised their young and are starting to come back here. I saw three very young birds. One of the juveniles was still begging for food from an adult. By the time they come back here they are able to look after themselves but some persist in begging for food from a parent. 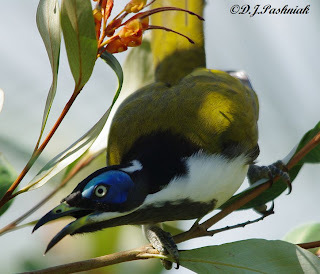 The parent bird does not seem to take much notice of them! This morning was the day for the mid-summer count for the Queensland Wader Study Group - so definitely not a day to be forgotten . When I woke it was overcast and had been raining. The radar on the Bureau of Meteorology showed a broken line of showers coming down from the north-east so it was doubtful that we could get a count done without getting wet. Oh well, in Queensland even the rain is warm! 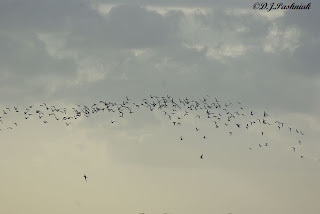 The birds were very flighty and several flocks were wheeling around in the air before we got anywhere near the roost area. I wish I knew what was disturbing them. 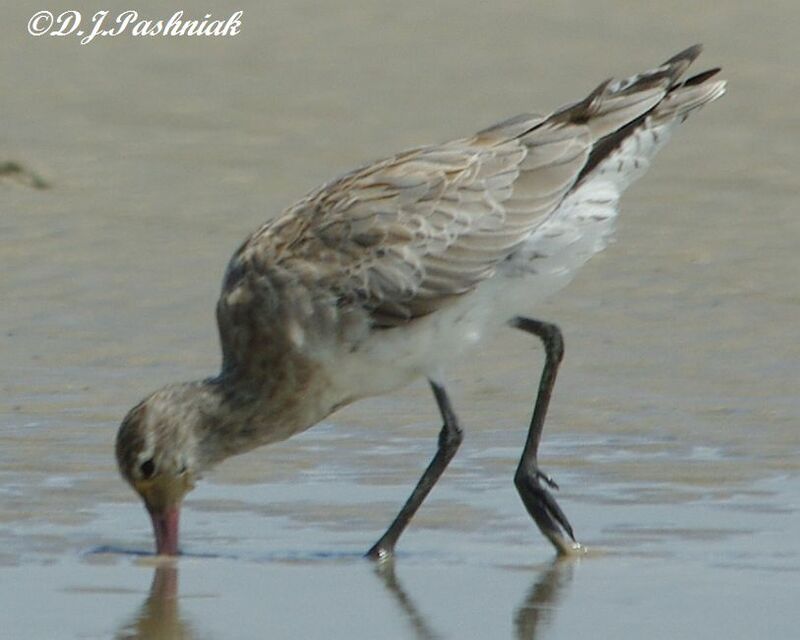 We counted a total of 189 birds of 7 species: Bar-tailed Godwits, Eastern Curlews, Whimbrels, Grey-tailed Tattlers, Common Greenshanks, Pacific Golden Plovers, and Masked Lapwings. 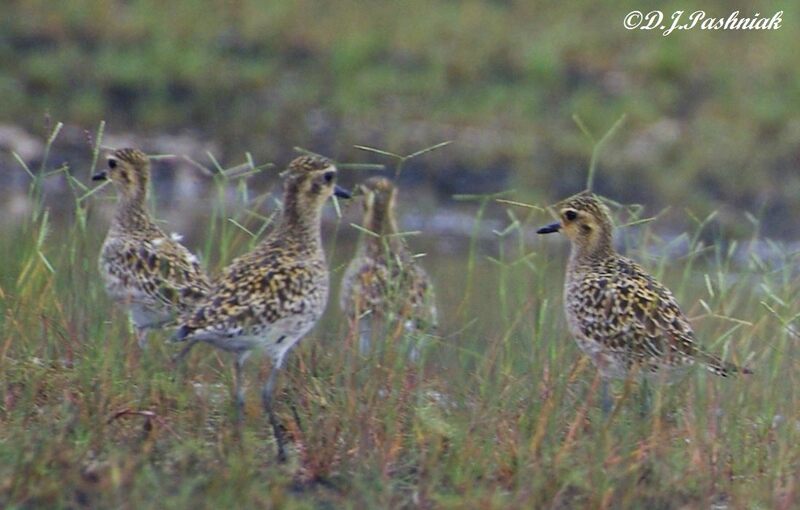 The only birds I got close enough to photograph were these Common Greenshanks and Pacific Golden Plovers and by this time it was raining again - although it was only light spits! However, as we paddled back to the cars on the other side of the creek it was getting quite heavy. Oh well, I was wet by now so what did a little more rain matter! Labels: Common Greenshanks, Pacific Golden Plovers. I went out to Inskip Point the other afternoon at low tide to see what birds were feeding out on the sand flats. I saw Eastern Curlews, Whimbrels, Bar-tailed Godwits, Lesser Sand-Plovers, Red-necked Stints, and Red-capped Plovers. 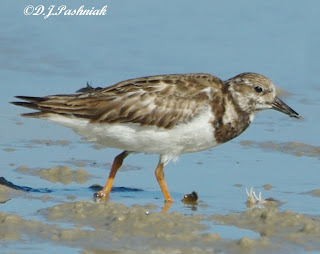 There were not great numbers of any shorebirds but this might have been because it was not a really low tide and I could not get out around the sand island. 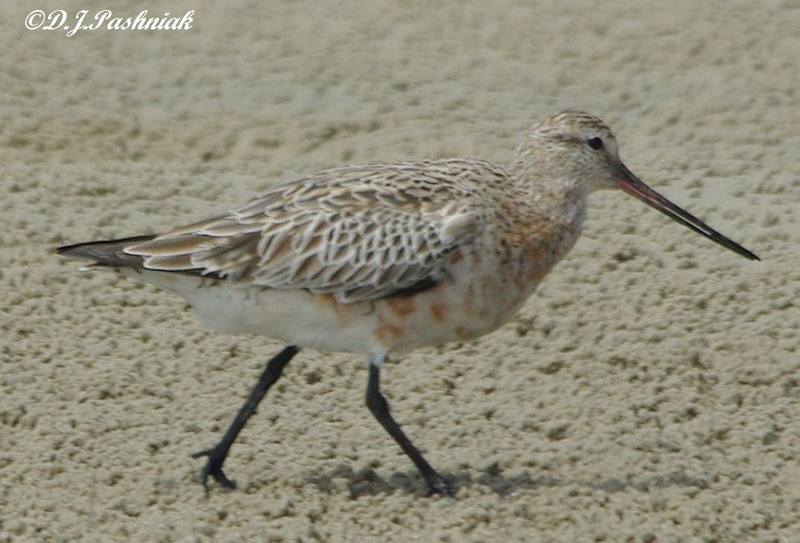 I saw this male Bar-tailed Godwit (Linosa lapponica baueri) showing new plumage all over and splotches of red down its front. Before it migrates this red color will completely cover the front. 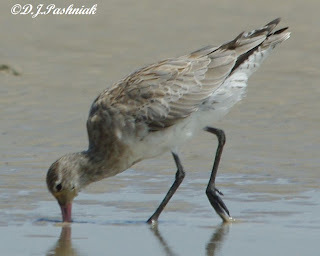 I also got a number of photos of other Godwits probing for small sea creatures deep in the sand with their long beaks. 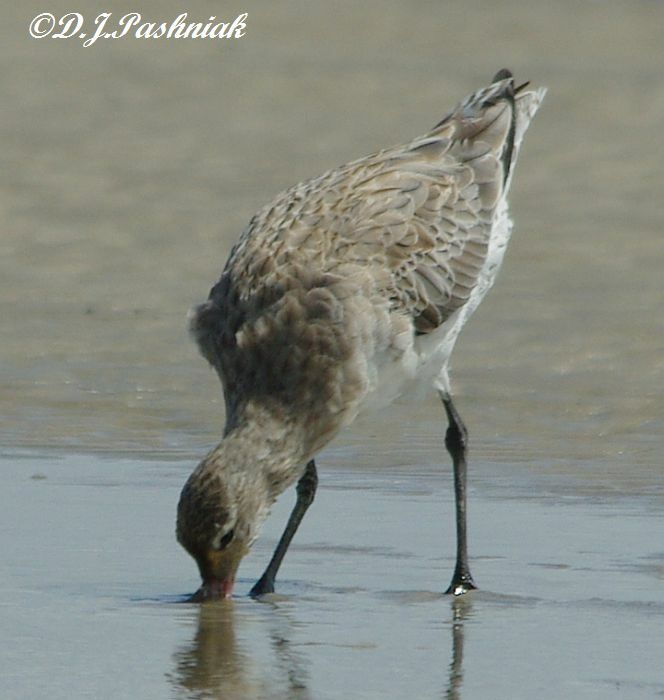 Wherever there is water the sand is very soft and the birds can get their beaks down a long way.